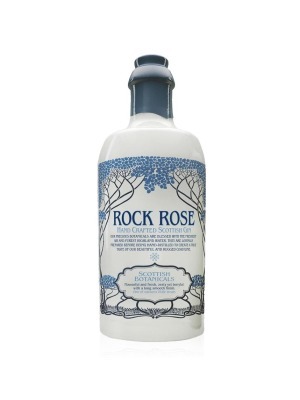 Rock Rose Gin is a popular Craft Gin available from DrinkSupermarket.com in 70cl to buy online. Visit DrinkSupermarket.com for the best price for 70cl of Rock Rose Gin or compare prices on our other Craft Gin products. When we had a taste of this Gin we couldn't get enough of it. It is such a great gem of a Gin which is hand-distilled by Dunnet Bay Distillers way way way up in Caithness Scotland. Rock Rose Gin gets its name from the botanical Rhodiola Rosea, literally a rose in the rocks. The botanicals are foraged along the cliffs of the Pentland Firth. The flavour of Rock Rose is unsurprisingly a touch sweet, heathery and so unique. Rock Rose selected Rhodiola Rosea as its key flavour botanical based on folklore which tells of Vikings foraging on these very same cliffs for the plant which was said to give the warriors extra strength for their journeys. Other traditional botanicals as well as sea buckthorn and rowan berries are foraged each year giving a unique profile to each batch. The gin is then hand crafted in a bespoke still (affectionately named Elizabeth). This small batch gin process creates only 500 litres of gorgeous gin each time. The final touch of hand-crafted love is the handsome bottle hand-sealed with wax and individually signed by the distiller. Where to buy Rock Rose Gin ? Rock Rose Gin Supermarkets & Stockists. You can buy Rock Rose Gin online in most retailers and find it in the Craft Gin aisle in supermarkets but we found the best deals online for Rock Rose Gin in DrinkSupermarket.com, Amazon.co.uk, 31dover.com, TheDrinkShop, and others. Compare the current price of Rock Rose Gin in 70cl size in the table of offers below. Simply click on the button to order Rock Rose Gin online now.